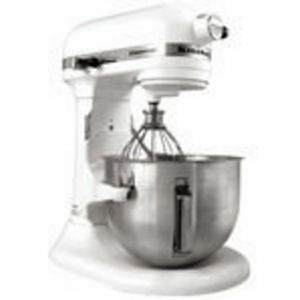 I would recommend this mixer for every household . This is my first kitchen mixer I've waited many years to buy one and I don't regret a single cent I paid. 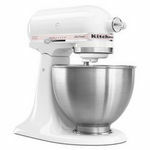 This mixer will stand the test of time and be handed down to the next generation in my family. 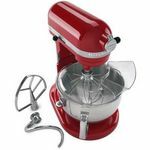 This kitchen aid mixer is amazing! You can't go wrong with kitchen aide products! Also, since theres so many attachments available for purchase it will save you space in the long run, instead of buying individual appliances. Received mine as a Christmas present and are happy with it. It is very heavy so of you don't have a permanent spot for it, it could be hard to move. Works great and has plenty of speed settings. Love that you can get different attachments for it. Just wish it would scrape the sides while mixing. This is the best thing you'll ever purchase for your kitchen. 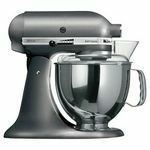 It mixes potatoes for mashed potatoes, it mixes your cornbread mix, cookies, muffins and muffin mixes, cakes...etc. This mixer does everything and my husband even uses it to shred cheese for taco night. It's amazing makes cooking easy. Love! Use every chance I get! 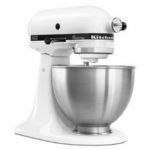 Every home Baker should have this mixer as a must in their kitchen. 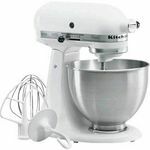 I fell in love with this after seeing a friends use her kithcen aid, I bought the professional version since i tend to burn up the motor in most mixers. LOVE this would highly recommend. I received my KitchenAid as a Christmas gift. I use it for all baking needs. It mixes evenly and gets any chunks out. I even use it for mashed potatoes, which are the best. It is a bit heavy but I don't carry it to much. It sits right on my counter for display.